We have a 34% interest in Petroleum Development Oman (PDO), the operator of an oil concession expiring in 2044. In 2012, production began at its Harweel EOR project, which is expected to produce approximately 30 thousand boe/d at peak production. We are also participating in the development of the Mukhaizna oil field (Shell interest 17%) where steam flooding, an EOR method, is being applied on a large scale. Pearl in Qatar is the world’s largest GTL plant. Shell operates the plant under a development and production-sharing contract with the government of Qatar. The fully integrated facility includes production, transport and processing of approximately 1.6 billion scf/d of wellhead gas from Qatar’s North Field with installed capacity of around 140 thousand boe/d of GTL and 120 thousand boe/d of NGL and ethane. Ramp-up of the project was completed in the fourth quarter of 2012. The plant delivered its 100th cargo in mid-December and produced GTL Jet fuel, with its first commercial market introduction in January 2013. 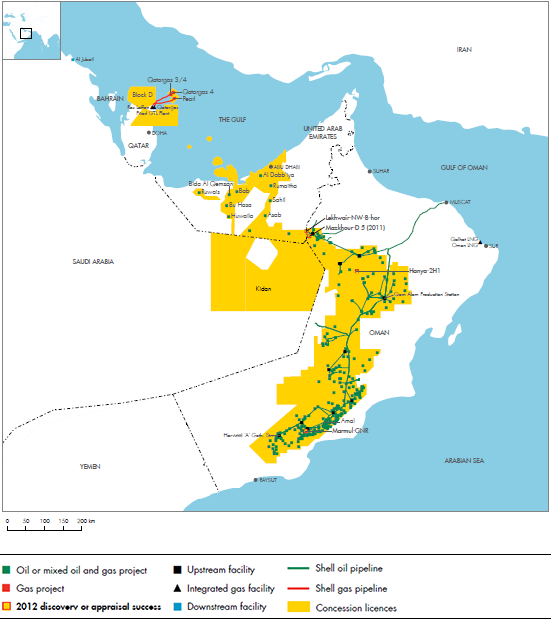 We have a 30% interest in Qatargas 4, which comprises integrated facilities to produce approximately 1.4 billion scf/d of natural gas from Qatar’s North Field, an onshore gas-processing facility and an LNG train with a collective production capacity of 7.8 mtpa of LNG and 70 thousand boe/d of NGL. The train delivered its first LNG in 2011 and has been operating at full capacity in 2012. The LNG is shipped mainly to markets in North America, China, Europe and the United Arab Emirates. We are the operator of Block D under the terms of an exploration and production-sharing contract with Qatar Petroleum, representing the national government. We have a 75% interest, with PetroChina holding the remaining 25% interest. In Abu Dhabi we hold a concessionary interest of 9.5% in the oil and gas operations run by Abu Dhabi Company for Onshore Oil Operations (ADCO). The licence expires in 2014. We also have a 15% interest in the licence of Abu Dhabi Gas Industries Limited (GASCO), which expires in 2028. GASCO exports propane, butane and heavier-liquid hydrocarbons that it extracts from the wet natural gas associated with the oil produced by ADCO.